Yesterday BGR leaked a few documents providing pretty much all the details on the new LG Ally Android phone except its price, and today Verizon filled in the only missing piece of the puzzle in the official LG Ally press release. Come tomorrow, May 13th, you'll be able to preorder this relatively low-end but still pretty sweet phone for $100 after a $100 rebate on a 2-year contract. 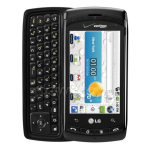 For a budget phone that already runs Android 2.1, has a 600MHz processor, a 3.2" screen, a 3.2MP camera, a full hardware keyboard, 802.11b/g and n support, and a 4GB microSD memory card, $99.99 is not a bad deal at all. BASKING RIDGE, N.J., and SAN DIEGO, May 12 /PRNewswire/ -- Verizon Wireless and LG Electronics MobileComm U.S.A., Inc. (LG Mobile Phones), today announced the LG Ally™ will be available in Verizon Wireless Communications Stores beginning May 20. The first Android device from LG, the Ally is the perfect assembly of futuristic, stylish design and 3G Android power for customers looking to tackle life's most challenging feats and everyday ventures. Verizon Wireless customers can pre-order the phone at www.verizonwireless.com beginning May 13. Access to updates on Twitter, MySpace, Facebook®, etc. The LG Ally will be available for pre-order online at www.verizonwireless.com beginning May 13. 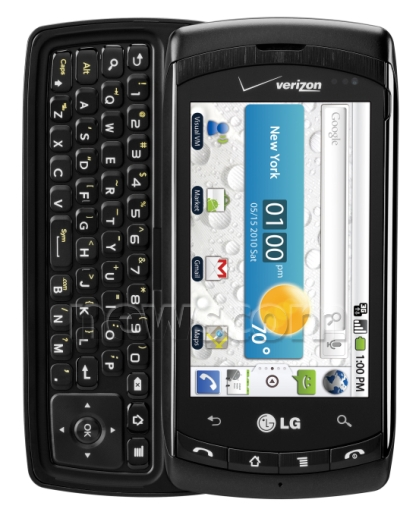 It will be in Verizon Wireless Communications Stores on May 20. Pricing will be $99.99 after a $100 mail-in rebate with a new two-year customer agreement. Customers will receive the rebate in the form of a debit card; upon receipt, customers may use the card as cash anywhere debit cards are accepted. LG Ally customers will need to subscribe to a Verizon Wireless Nationwide Talk Plan and an Email and Web for Smartphone plan. Nationwide Talk plans begin at $39.99 monthly access. Email and Web for Smartphone plans start at $29.99 for unlimited monthly access. For additional information on Verizon Wireless products and services, visit a Verizon Wireless Communications Store, call 1-800-2 JOIN IN or go to www.verizonwireless.com.